The National Screen Institute (NSI) has announced their call for applications to their NSI Drama Prize program. The NSI is based in Winnipeg and is one of Canada's leading film schools. The Drama Prize is for filmmaking teams of two or three people with a short film fiction project of no more than 10 minutes. The teams should consist of writer, director and producer but the writer may double as the director or producer. The director and producer, however, may not be the same person. Successful applicants will be expected to spend some time in Winnipeg as part of their training, but the remainder of the training and the production of the film itself can take place in wherever the teams are based. This is an excellent program for emerging filmmakers. The application is very detailed, so you will want to get started on it as soon as possible. The deadline for applications to be received in their office is Wednesday, November 17, 4:30 p.m. Central Time. They do not accept applications by fax or email. Canada’s National Screen Institute is accepting applications from emerging filmmakers for its 2011 NSI Drama Prize training program. Writers, directors and producers receive training in the production of a short film using mentoring and intensive filmmaking workshops delivered by leading industry experts. Filmmakers must apply as a team and submit a finished script with their application. Their proposed short film should not run longer than ten (10) minutes. Get the application kit now. Apply by Wednesday, November 17, 2010, 4:30 pm CST. 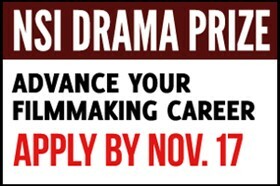 NSI Drama Prize is an ambitious program that provides a year of professional support and training in filmmaking. Up to four teams of Canadian filmmakers will receive customized training in writing, directing and producing. After training, teams have two months to complete a project assignment. Following assessment of the assigned work, selected teams are eligible to receive year-long mentoring from established industry leaders, $10,000 in cash support and over $30,000 in services toward production of a short film. A special training program podcast with NSI Drama Prize program manager Joy Loewen has been added to the NSI website. Joy will also be hosting two Facebook clinics on October 20 and November 4 from 10 a.m. to 3 p.m. Central Time to answer your questions. The recently completed NSI Drama Prize films have screened at prestigious North American film festivals including the Toronto International Film Festival, Palm Springs International Short Film Festival, Vancouver International Film Festival and Montreal World Film Festival. NSI Drama Prize is made possible by Presenting Sponsor Telefilm Canada; Program Partners Canwest and The Brian Linehan Charitable Foundation; Strategic Sponsors Rogers and Women in Media Foundation; Award Sponsors Rogers Group of Funds, NSI Alumni Fund, The Brian Linehan Charitable Foundation and Telefilm Canada; Provincial Sponsor Film Nova Scotia; Service Sponsors PS Production Services Ltd., Deluxe, Kodak Canada Inc.; Risk Management Consultants Multimedia Risk Inc.; as well as William F. White International Inc.